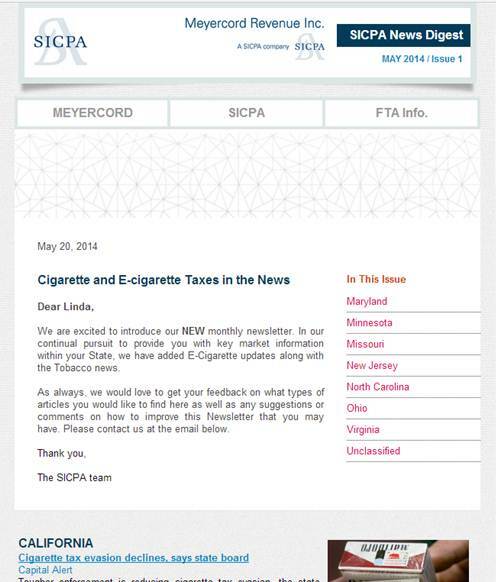 Meyercord Revenue Inc., a SICPA company, is introducing a new excise tax stamp solution to help curtail the counterfeiting of excise tax stamps and to enable state governments to more effectively collect owed tobacco excise taxes. The next-generation, heat-transfer FUSON OASIS® system includes new overt and covert security features that correspond to the highest available security industry standards for tobacco tax stamps protection and allow for quick and reliable authentication by law enforcement and the general public. The system was unveiled June 13, 2011 at the Federation of Tax Administrators' annual meeting in Omaha, Neb. "Advanced excise tax stamps are a cost-effective method to help governments collect the tobacco taxes due to states, counties and municipalities," said Shelley Vereen, SICPA's vice president of sales. "The stamps are also used as an investigative tool to help enforcement agencies prevent illicit trade and interstate smuggling efforts." Advances in digital technology and printing, however, have made it easier for criminals to counterfeit basic stamps and avoid paying taxes on tobacco products. In addition to costing necessary funding for capital expenditures and public services, the sale of black market cigarettes also finances organized crime and terrorist groups, according to government reports. Excise tax stamps are used by government agencies to determine whether appropriate taxes have been paid on tobacco, alcohol or other luxury good products. Worldwide, SICPA provides solutions for over 45 billion excise tax-bearing products, helping governments collect more than $55 billion in excise taxes. The new heat-transfer FUSON OASIS® system improves upon the earlier-generation, heat-transfer FUSON® stamp, retaining those features of the stamp that remain effective today while addressing known vulnerabilities. The original FUSON® stamp will be phased out over the next 12 months. Proprietary color shifting ink, which enables consumers and retailers to identify authentic stamps without the aid of any tools, and enable an advanced polarizing effect, that requires the aid of a small credit card-sized validator or a specialized light source. Using both short- and long-wave fluorescent inks in the watermark, adding complexity and cost to counterfeiting attempts. Proprietary taggants that emit a unique secure signature which can be authenticated using a hand-held scanner. Unique identification numbers for each stamp, allowing retailers and field auditors to quickly determine if packs of cigarettes have been properly stamped with authentic stamps. Enhanced stamp chemistry that improves stamp adhesiveness on cigarette packs, decreases stamp flaking and allows for authentication techniques that do not damage the stamps. The new chemistry also reduces Volatile Organic Compound emissions and improves the sustainability of the print process. Microprint which deter the ability to reproduce a legitimate stamp's text by photocopy or scanners. Meyercord Revenue's new FUSON OASIS® system is more than a tax stamp. It also incorporates an online training tool for law enforcement personnel and auditors, tailored outreach programs to educate retailers and consumers about the stamp and how to report suspected counterfeits, and a suite of simple and effective enforcement solutions that allow for real-time authentication – ranging from low-cost, credit card-sized validators for retailers to do their own checks, to hand-held detectors used by law enforcement officials. Also, for the first time, Meyercord Revenue is offering direct-to-distributor shipping, web-based ordering and approving on its Heat Transfer product line. These services are designed to integrate seamlessly into governments' electronic tax collection initiatives, helping to reduce costs, risk and paperwork. "We are proud to offer states a solution that will significantly enhance their ability to identify and seize illicit products and increase tax collection," said Charles Finkel, SICPA's executive vice president. "Using the FUSON OASIS® system, retailers can easily authenticate tax stamps and be confident that the cigarettes they are selling have been properly taxed. What's more, this stamp is applied to cigarettes using the same technology as the current FUSON® stamp, requiring no new equipment for distributors."